Healing Arts Press, 9781620552728, 324pp. Tari Prinster is a certified yoga teacher, founder of yoga4cancer, former director of Women’s Cancer Survivor Program at Om Yoga, New York City, yoga ambassador for the Living Beauty Foundation, and a breast cancer survivor. Her work has been featured in the documentary YogaWoman and in Yoga Journal. She has presented at conferences held by Yoga Journal, Yoga Service Council, and International Alliance of Yoga Therapists and has published articles in many yoga publications. She lives in New York City and Vermont. Cyndi Lee is the founder of OM yoga. 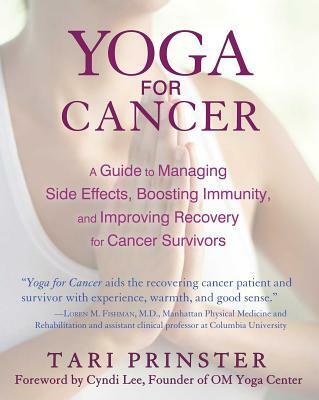 "An important addition to the growing collection of helpful resources for cancer survivors and yoga teachers is cancer survivor and yoga teacher Tari Prinster's recently released book, Yoga for Cancer: A Guide to Managing Side Effects, Boosting Immunity, and Improving Recovery for Cancer Survivors."